Have I really never discussed with you peeps my love for mint chocolate chip ice cream? Let me rephrase more accurately -- my looooove, my looovvvvvelurrrrrvemmmmnomonomnomnomohmommymygoddammmnnn for mint chocolate chip ice cream? That's just not possible. Is that possible? What's really not possible, then, is that it's taken me this long to talk about the Grasshopper. It is no mistake that in his book How's Your Drink? : Cocktails, Culture and the Art of Drinking Well, my cocktail-historian crush, Eric Felten, chooses to discuss the Grasshopper, an all-liqueur dessert cocktail, immediately following the Pink Lady and preceding the Smith and Curran (aka the electric egg cream). Of those three, actually, the Pink Lady could wipe the floor with the other two, because at least the Pink Lady contains gin (as well as applejack brandy, which is no joke, and raw egg white, which has its certain Rocky connotations even as it does lend a cocktail a cap of frilly froth). According to Felten, the Grasshopper was "a fad cooked up by marketing johnnies around 1949. 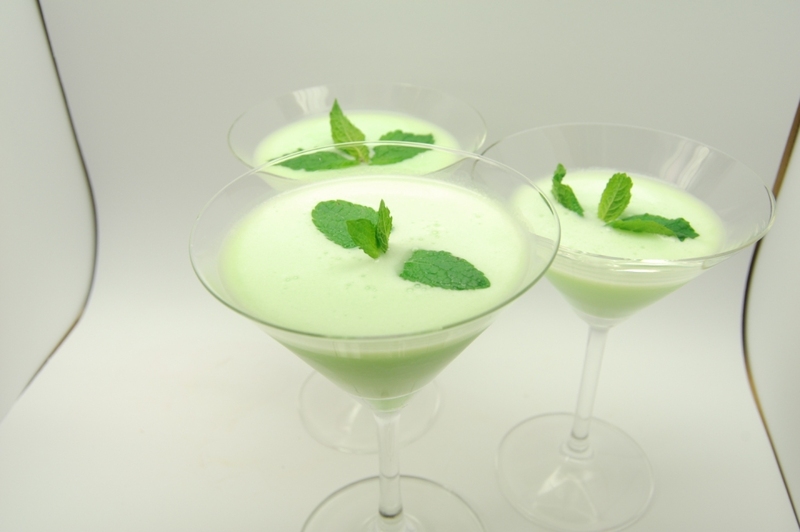 The Leroux Liqueurs Company of Philadelphia only made cordials, so what better drink for them to promote than one anchored by a pair of liqueurs... Sweet, creamy and pretty, the Grasshopper quickly became an iconic girly drink." And then he goes on to cite various postwar scribes who damned the drink with faint praise ("so-called cocktail," "something of learned vulgarity") in a way that reminds me of how current-day critics love to jump on the Girls hate-wagon in what basically amounts to condescending woman-bashing codespeak. 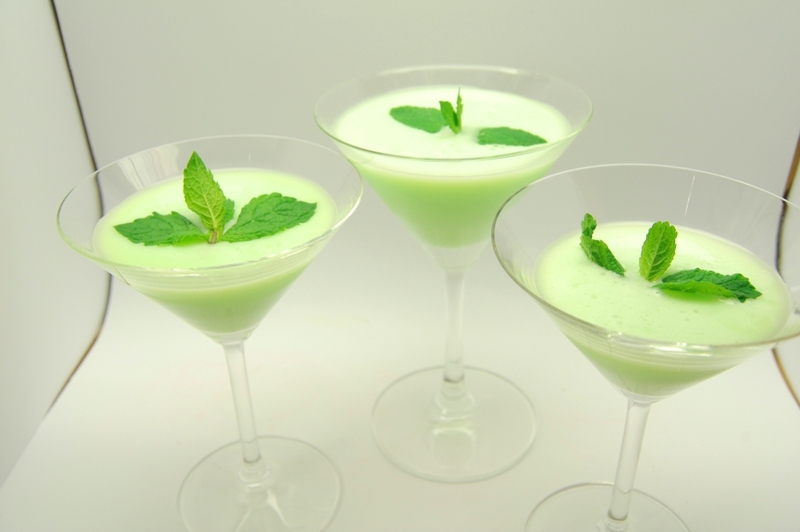 When I was watching the PhoBlograpHusband edit these gorg Grasshopper pics he shot, I asked him, "Is that really just cream and creme de menthe and creme de cacao? Is that really all we put in there?" And he looked at me funny and I said, "I just can't believe -- it just doesn't seem like those are three ingredients that would really coalesce together as well as they do. I just can't believe how good this cocktail looks." See, I internalized the girly-bashing just a bit, when what I really need to internalize is another Grasshopper. In my belly. That's what she said! Combine the three liquid ingredients in an ice-filled cocktail shaker. Shake vigorously for about 20 seconds. 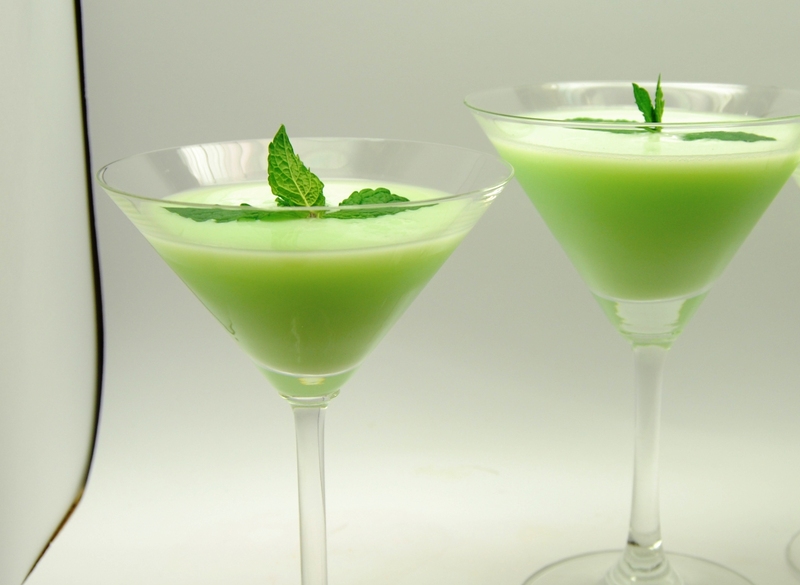 Strain into a chilled cocktail or martini glass. 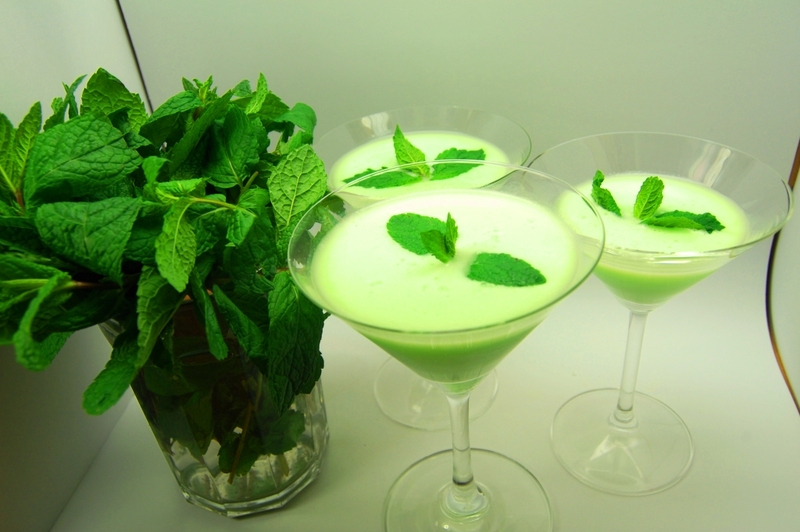 Top with mint leaves or chocolate shavings. Obviously, the stiffer you like your drink, the closer you want to hold to that 1:1:1 ratio. Add that extra ounce of cream for your cousin who just turned 21. Felten says you can use either light (i.e. clear) or dark creme de cacao. I'd play it safe and stick with the light as I would not want to risk a swampy-hued Grasshopper. Felten, for what it's worth, describes the resulting shade as sage green. Revenge of the Sage Thing!! !